..:: » General Forums ::.. I have received the following urgent email(s) appealing for help in clearing the minefields around Cuito Cunavale. I have arranged the Original Messages in chronological order to make it easier to read and have obscured all email addresses in order to protect the senders' privacy. If ANYONE can assist in this matter, please respond by posting to this Forum, or contact me at johan@warinangola.com and I will forward your response accordingly. We were in touch a couple of years ago when you carried out some research on my behalf, and I wonder if I may ask your advice. I am presently living in Angola, at a place called Cuito Cuanavale, working for a charity called the HALO Trust. I manage an operation which is clearing extensive mine belts left over from the civil war, particularly the heavy fighting in the area between 1985 and 1988, in which South African forces were involved. Professionally laid by military engineers, it consists of minimum-metal mines which are very difficult to detect, and there is also evidence of booby traps and other unpleasant surprises. We recently came into possession of copies of some old South African minefield maps which show a small portion of the mine belt in some detail, although its exact geographical location is unclear. We would very much like to try and trace the original minefield maps, which we believe still exist in the military archives, possibly in Pretoria. One of my bosses will be passing through there shortly and could spare a day to investigate further, but we have no idea of where we should be looking, or who to speak to. Would you be able to make any suggestions on how we may go about tracking these maps down? Would you have any idea where I might find these maps (see red below)?? I will try the SADF but I thought I would check to see if you have any suggestions. Recently received below from my RSA researcher and thought you may be able to assist Julian Hocken of the Halo trust. Thanks and appreciate any asssistance. I have forwarded your request to a close friend of mine Jim Panzegrouw who is in Jordan directing UNOPS. He is a SA Sapper and was extensively involved with mine clearing also in Africa especially Sudan. He was in Angola as well. He should be able to assist. Interesting we met some of the mine clearing guys in Angola during our recent Battle Field Tour. Jim - could you please assist? To: "Roland De Vries" xxxxxxxxxxxx [email address blocked out by host]; "Polack"
Comprehensive maps of those minefields were drawn up by 2 FD Engr Regiment (if I remember correctly they were the responsible unit). I also recall that during the mid 90,s the Angola government requested these maps and it were made available through the Military attaché of the South African Embassy in Luanda. Somebody else that might know more about the location or existence of the maps might be William Endley - now working for Ronco in Sudan, his last position before he left the army was Chief of Staff of the South African Engineer Formation. Sorry guys - this is what I have! To: "61 - Peter Polack" xxxxxxxxxxxx [email address blocked out by host]; "Roland De Vries"
- With maps they have in hand - can he supply us with the map numbers and grid references. That will help a lot, because with this info in hand we can zoom our efforts into a specific area. With these type of info we can approach our contact list and maybe someone will remember something so that we can unlock the request. Julian is working at the Halo trust - they are lifting mines in the Cuito Area and is requesting some help/info on the positions of South african mines planted. Hopefully you can point him in a direction for help so that they can lift these mines - if any? I know it is almost 20 + years later, but maybe you guys can put some light on the matter. A line to say many thanks for circulating my request for help. Attached to add a little more context is a Google Earth image with our latest survey / clearance information overlaid. Resolution is not the greatest I'm afraid, but the original would take me about a week to send through the internet connection here. The Cuito and Cuanavale rivers meet at about the centre of the picture; at centre left is the town itself, with the runway running out to the minefield we have designated 339. Our base here, from which I write, is at the eastern end of the runway. The South African barrier minefield for which we are trying to track down maps is numbered 029, at the right side of the picture. As can be seen, almost all of our clearance here so far (since 2006) has focussed on removing the FAPLA / Cuban laid defensive mine belt to the south of the town. We should complete this within the next couple of months, after which our focus will switch to the very thick Cuban / FAPLA minefield marked 028, covering the main Angolan position in the Tumpo area (where three Olefant tanks can still be seen), and the northern part of 029. "MYNVELD GELE DEUR 13 VEIDGENIE REGT OP 19 EN 20 APRIL 1988. IN BEVEL VAN LT. PVZ DU TOIT, RSM, LT. G. PLACE EN 'N UNITA ELEMENT ONV. KAPT. CHIKUKUMA (UNITA ENGINEERS) VAN 5th REGULAR BTN ONDER BEVEL VAN KOL. KIMBA, LT. A. STYON, LT. PVZ DU TOIT. OP. GETEKEN DEUR LT. G. PLACE EN LT. C. NEL OP 1988-05-06 TE 24 VELD." I do not know any Afrikaans, but get the drift in that it seems to give the names of the officers and units responsible for laying that particular part of the mine belt. I would also be interested to know what mapping system / datum would the SA military have used in 1988? The bits we have contain references such as 'RV 164193 CU (Geskat)' and 'RV 163189 CU (Geskat)', which it seems reasonable to assume are geographical co-ordinates. However it is proving difficult to match them up to a precise location. We work in UTM, WGS 84. Grateful for any information at all which may help with our work. From the back of beyond here it's difficult to get access to much which can give impart some background to the fighting. My own reading has been limited to Col. Breytenbach's very interesting history of 32 Battalion, plus whatever I can cull from the internet, so any pointers are most welcome. Thank you for your reply and advice sir. I'm sure you've seen similar photos to the attached before (and may in fact prefer not to be reminded! ), but sent anyway just in case you're interested. These were taken a couple of months back when I was doing some survey in the area. I haven't seen the third tank - believe it's outside the rather dubious clearance of footpaths carried out by Angolan military engineers ahead of President Mbeki's visit a few years back. Thanks Julian, hopefully we'll get some positive response shortly on your request. Will it be possible to visit the tanks on our annual veterans tour to Cuito planned for September/October 2011? Can you arrange a visit with the powers that be? Gerhard - some photographs of the Olifant tanks. I believe that will bring back memories of note. I'm already a fair bit wiser thanks to you gentlemen and have high hopes for the future. In particular, I can now see that even if we can't track down full copies of the SA minefield maps, it would be very useful just to find copies of the ordinary SADF maps of the Cuito area, particularly sheets CU and CV. This would allow us to make a lot more sense of the fragments that we have. So far as visting the Olifants goes, I should say that I am due to be posted elsewhere at some point next year, so probably would not be around in person to welcome you. However, I will be meeting my eventual replacement at Christmas, and will be sure to tell him to extend you every courtesy on your next visit. It will certainly be very beneficial for him to meet some South African veterans and hear first-hand of the campaign. Keep my hotmail address and let me know before you go so I can put you directly in touch with the right HALO person. In terms of permission, I doubt that it would cause the local authorities much concern. I always check-in the passports of visitors with the local cops just so they know who is around; they don't like people taking pictures of the area around the airport, but they're generally pretty benign. The greater concern when visiting the tanks is that they are still sat in the middle of a minefield, and should anything untoward happen we're a long way from competent medical assistance ! So apart from anything else, don't mention it to your insurers... From behind bairro Samaria, the first little village just on the other side of the bridge over the river Cuito, there is a track that goes up to another little settlement. The track is drivable as far as these huts. From there it's just a few hundred metres on foot, and one of the men of the village will generally be happy to act as a guide. As previously mentioned though, the footpath in is pretty dubious, and unmarked. It goes past the remains of a Land Cruiser and a very large hole in the ground where seven Angolan soldiers ignored the locals' advice and tried to drive in during November 2008 - last thing six of them ever did. The good news is that we should have started our own clearance there by the time of your visit and so it may be a bit more straightforward. We'll keep contact and I'll convey the message to our tour planners/tour operators to keep the possibility in mind during planning our next Cuito visit. Normally some of the ex-commanders travel with and I know they will give you guys a comprehensive overview of the SADF battle design etc at the time. It will also be appreciated if we can make contact with some of the Angolan ex commanders at the time. Maybe the governor of Cuito can help you/us in that regard. We handed him a memorial cross during the 2010 trip and he was very accomodating in his approach. We can approach him ourselves if you can pass on his contact details, please? I am trying to find an engineer to translate some of the Afrikaans engineer spec's/language so that you might be able figure out the formation of the layout of the mines. I think you are very much at the actual grid reference of the minefield and a translation of the Afrikaans on the map can help you in plotting the way it was done or planted. From the fragments of the maps that we do have I have a couple of questions that you may be able to answer. 1. What mapping system / datum would the SA military have used in 1988? (do you mean which type of maps we use, so that you can translate the grid reference to it and your system? Your grid references is a 6 digit number. Can that be that we use 1;100000 maps, Jan?) The bits we have contain references such as 'RV 164193 CU (Geskat)' and 'RV 163189 CU (Geskat)', which it seems reasonable to assume are geographical co-ordinates. However is is proving difficult to match them up to a precise location. We work in UTM, WGS 84. The abovementioned give the names and engineer regiment laying the minefield. We hope to allocate some information from them as well. Remember it is like looking for a needle in a haystack, finding the actual personnel. Check with INAROE in Luanda. The SADF handed over all minefield records many years ago. From the below: it seems you are dealing with a centre row of A/T mines 5 m apart , each mine is protected by 2x A/P mines, 2 m from the A/T in the 10 and 2 o’clock positions. All A/T mines have been fitted with a anti lifting device and then there are two rows of A/P mines, 3 m from the centerline, on either side. Some of the A/P,s have been connected with det cord to claymore type mines. With UNITA involved you must be careful of further mines – type 72,s outside of these mine lanes! If there is more – will be crateful to help! 1.. What mapping system / datum would the SA military have used in 1988? WE WOULD HAVE USED THE SAME DATUM THAT WAS USED ON THE OLD BLACK AND BLUE TOPO MAPS WE HAD OF THE AREA DATUM NAME IS UNKNOWN (do you mean which type of maps we use, so that you can translate the grid reference to it and your system? Your grid references is a 6 digit number. Can that be that we use 1;100000 maps, Jan? 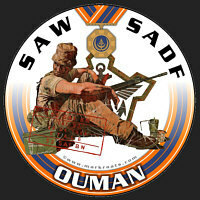 YES IF IT IS THE OLD SADF MAPS 1:100 000 scale) The bits we have contain references such as 'RV 164193 CU (Geskat)' THIS SETTING ON YOUR GPS IS UNDER POSITION FORMAT MGRS (the official name for the 6figure grid reference system we all used and 'RV 163189 CU (Geskat)', which it seems reasonable to assume are geographical co-ordinates. However is proving difficult to match them up to a precise location. We work in UTM, WGS 84. UTM IS THE 6 fig system BUT NOW 13 fig Grid so it should read something like ???? 33 N ?164?? ??189?? The answer to the question 1. has been supplied by Kevin Bolton – much appreciated! All directions is in compass bearings. All A/P mines are 10 o’clock and 2 o’clock positions except indicated differently (and 2m distance). All A/P mines are 3m away from the center line except if indicated differently, This mean that all A/T mines are protected by 2 A/P mines, 2 m away at the 10 and 2 o’clock positions AND that there are more A/P mines 3 m away from the centerline. I assume that the A/T mines are on the centerline. 'NOTA: 4 OMPETING EN KARTERINGSREGIMENT AANVAAR GEEN VERANTWOORDELIKHEID VIR NIE AKKURATE INLIGTING [illegible] ONDUIDELIKHEDE AS GEVOLG VAN MOONTLIKE NIE ONDUIDELIKHEDE OP DIE OORSPRONKLIKE KAA...' [illegible] (This phrase indicate roughly that the information can be in doubt - this was the days before GPS's I believe) This was before the days of GPS. 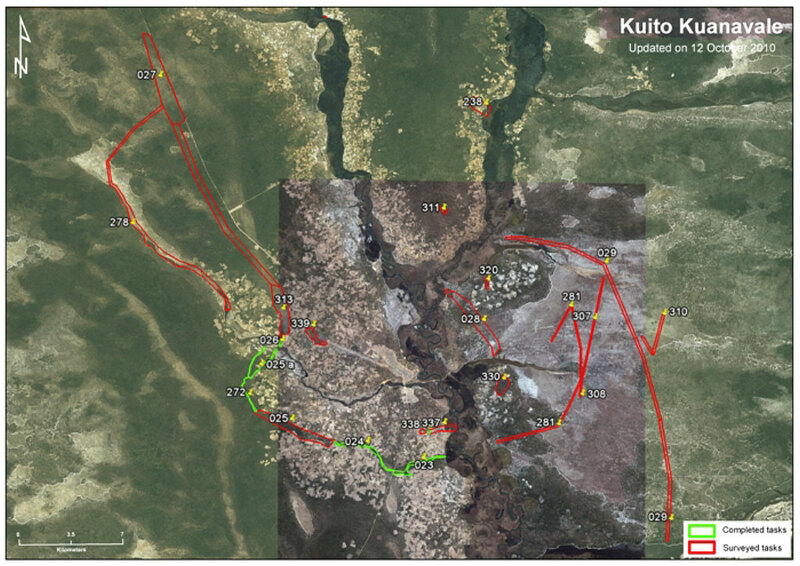 – All this mean is that the unit (4 Plotting and Mapping Squadron) does not accept any responsibility for the accuracy of the maps as this was done based on information supplied that might not be accurate. 3. What is meant by 'ALD' (as in 'ALLE A/T MYNE MET ALDs'). I'm assuming this is an acronym for 'anti-handling device', but it would be good to have confirmation. (Jim ?) ALL A/T mines have been laid with Anti Handling Devices! Many thanks for your very useful reply, and my apologies for the delayed response. I have been on the road and out of email contact the last few days, while visiting some of our other remote camps elsewhere in Kuando Kubango province. Thank you especially for the tip on possible UNITA additions. I have learned to take nothing for granted on the mine lines here in Cuito Cuanavale: we are constantly turning up odd little surprises even on the Cuban / FAPLA minefields. All good fun though and keeps it interesting. I am now collating the information received from you and others and will certainly be back in touch should more questions arise. Some details for you are below and attached. These are from our staff in Angola. Here is the grid reference for the position of the South African Olifant Tank. 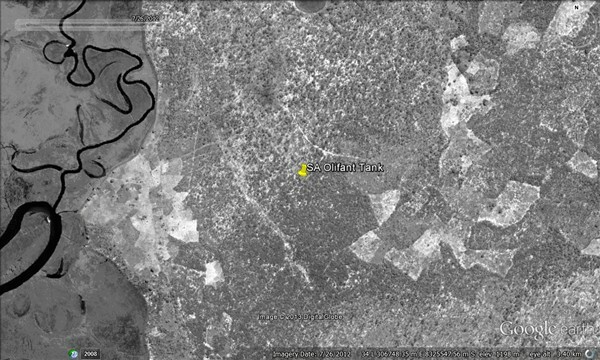 We also have information of two destroyed tanks (most probably SA Olifant tanks) north east of here. We cannot confirm these ourselves simply because they are located in a mined area. Recently we have surveyed two minefields in that area.